This route has long been in use by walkers, riders and cyclists, but only part of the route is on the definitive map (as a footpath) and the rest is unrecorded. In order to prevent it from being stopped up forever on 1 January 2026, we need to collect evidence of use and make an application for the whole route to be recorded as a bridleway. This is the only way to guarantee that all the public rights will be retained on the cut-off day. The evidence we submit needs to be from people who have actually used the path on foot, horse or bicycle and who fill in a form to say so. If you have ever walked, ridden or cycled this route, please get in touch (trust@pgbt.org.uk) and we will send you an evidence form. Image based on original obtained from the Ordnance Survey Get-a-map service (2006). 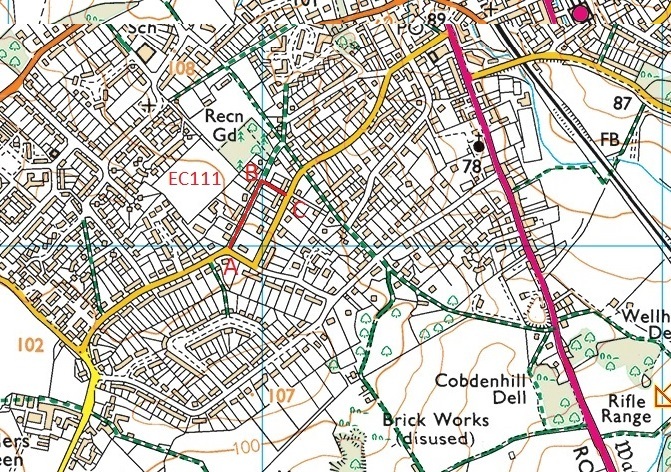 Image reproduced with kind permission of Ordnance Survey.